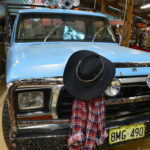 then you will not have seen the incredible display of all the props from the movie and television series Wolf Creek including the iconic blue F-100. Amazing Mill Markets owner Mark Ward negotiated a deal to buy the iconic F-100 and famous props from director Greg McLean. They are now on show permanently in the new ‘Outback Room’ at Ballarat. Alongside these great props are 15 new stalls filled with complimentary stock. Come on in and have your photo taken alongside these famous props, and guess what it’s for free.